Unny is a co-founder and the Executive Director of Compassionate Action for Animals. Please see his biography. Do you enjoy Subway's Veggie Delight sandwich but wish you could feast on a "meatier" animal-friendly meal? Our allies at Compassion Over Killing have successfully lobbied Subway, and now select Subway restaurants throughout Canada are starting to dish out an all-vegan patty, promoted as the "Totally Vegged" vegetable patty! Visit WeLoveSubway.com and call Subway at 203-877-4281 to add your voice to the thousands of others who are urging the company to add hearty vegan options to all of its menus. Looking for veg-friendly restaurants? Then check out VegGuide, our online guide to veg-friendly restaurants and shopping! VegGuide has over 16,000 entries world-wide, and there are all sorts of features to help you find them. You can search for entries near a specific address, look for only vegan-friendly places, and much more. When you visit the front page, it automatically finds the restaurants nearest to you. Whether you are at home or on the road, VegGuide has everything you need to make your dining experience a pleasure. VegGuide is a community-driven website, and anyone can rate an entry, write a review, or add a new entry. If you've visited a restaurant recently that you loved or hated, share that with us. To rate a place you've visited, just go that place's entry on the guide and use the stars to the right of the entry's name. Every entry also has a "Write your review" button below those stars. We love new reviews! You can also upload photos like building exteriors or dishes you've eaten. Every entry has a button on right labeled "Add/edit images". Click on that button for the image uploading form. To add a new entry, just find the region it's located in and click on the "Add Entry" button near the top of the page. You'll be prompted to fill out a form describing the restaurant (or bakery, etc.) that you want to add. Once you've added the entry, please rate it and write a review. 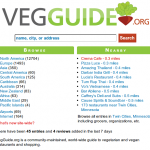 Visit VegGuide now or go straight to the Twin Cities area listings. While people are gathering together with family and friends for the holidays, many will not consider how the Thanksgiving turkey ended up as their centerpiece or how the holiday ham made it from farm to fork. At Compassionate Action for Animals we will be working hard to bring to light the many injustices animals will suffer, mostly out of tradition, this holiday season. Fortunately, each of us can help prevent the needless cruelty and violence these animals endure by making the switch to a healthy and compassionate vegan diet. Can you continue your support and sustain our work by making a contribution of $50, $25, or $15? We are striving year-round to raise awareness of the plight of farmed animals at the hands of the meat, dairy, and egg industries, and I am convinced that the work we are doing is making a difference for the animals in our world. We hosted regular educational and outreach events such as: visits to local schools, book club meetings, literature distribution, dine-outs to break bread with old friends, our successful restaurant outreach program, and new cooking classes where we learned about holiday cooking with a twist – it's animal-free. Special events included this year's Veg Week , a presentation by Paul Shapiro of the Humane Society of the United States, a "Shop with a Vegan" event, and a sanctuary tour giving participants the opportunity to learn about chickens and their individual personalities. Our efforts and the overall progress of our movement wouldn't be possible without the generous support of donors like you. Please consider donating to CAA this holiday season. Donating makes a great gift in honor of the animals or on behalf of someone special! We will notify that "someone special " with a thank-you card. Your tax-deductible donations will be used to fund our mission of reducing and eliminating the suffering of factory-farmed animals. Give the gift of compassion this holiday season, and help make a difference! Announcing the First Ever Twin Cities Veg Fest! Compassionate Action for Animals is hosting the first ever Twin Cities Veg Fest on July 14th, 2012. Twin Cities Veg Fest is for anyone and everyone – from vegetarians and vegans to omnivores! If you've ever thought about becoming vegetarian or are interested in reducing animal suffering, you'll love Twin Cities Veg Fest. Learn where your food comes from, how to be a healthy vegetarian or vegan, and why being compassionate benefits everyone. Plus you'll enjoy tons of free food samples and delicious vegan cuisine. The festival will take place from 10 am to 5 pm in Coffman Memorial Union at University of Minnesota in Minneapolis. 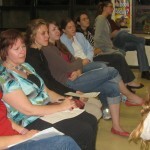 Check back here or at TCVegFest.com for forthcoming details, and follow us on Facebook and Twitter. and many other such abuses. The investigation was covered by 1,500 news outlets in worldwide. Please consider opting out of this cruelty by exploring a plant-based diet. Have you come to Compassionate Action for Animals' annual banquet in April before? Please check out the blog by our caterer. Ciree Linsemann catered our banquet in 2011 and 2010. Her exquisite meals were enjoyed at our annual fundraiser, and now you can enjoy her creativity by making her vegan recipes at home. Check out her blog, which has her excellent recipes! She has recipes for Masala Meetballs and Zesty Sour Creem, vegan dog biscuits, Texas Sapporo Mole Flood Dumplings, and more. Help animals by giving to Compassionate Action for Animals on Give to the Max Day on November 16th! When you donate to CAA, we become eligible for $1,000 randomly-selected prizes. When we contemplate the future, we see a world where factory farms no longer exist. Animals are treated with kindness, compassion, and respect, rather than as tools or machines. But we can't reach this future without your help. At Compassionate Action for Animals, your donations support our efforts to reach out to the public and educate them about the horrors of modern factory farming. Your support lets us continue our leaflet distribution, video showings, and food giveaways, as well as our many other outreach, education, and community-building activities. As we announced last week, we'll be holding our annual Vegan Thanksgiving Potluck on November 19th. This year, we have a new plan for the raffle: you can enter the raffle for free simply by bringing a card with your recipe! Attendees will be able to sign up to receive the recipes that they like via email at the event. 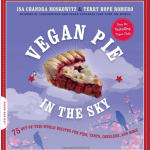 We'll have lots of fun prizes for the raffle, including Isa Chandra Moskowitz and Terry Hope Romero's new cookbook, Vegan Pie in the Sky! Isa is a favorite chef of ours, and we even had her speak here last year. You can also connect with this event on Meetup and Facebook. Subway, the world's largest restaurant chain, tweeted about Vegetarian Awareness Month and asked for feedback. Please let them know what you think. 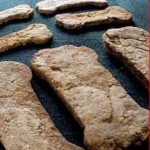 Visit WeLoveSubway.com and ask for more vegan options there. Post on Subway's Facebook page. Thanks to our friends at Compassion Over Killing for leading the way to get more vegan options at Subway and other chains. In the aftermath of signing a pledge to spend a week eating vegan or vegetarian, most students are curious about what to do next. Yes, grocery shopping is a must, but then what? Fortunately, CAA has thought of everything to help out a new vegan. Annually, Veg Week holds a cooking class for new vegans; this year's class managed to fill the room. 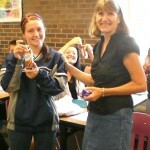 The presentation was given by long-time CAA volunteer Rachel, who themed her class with a fitting autumn feel. The dishes made were a butternut squash bisque, walnut sage fettuccine, and a pear and ginger compote for dessert, perfect recipes for taking home to an extended non-vegan family on Thanksgiving. Vegans and carnivores alike enjoyed this presentation, and everyone agreed, once they tried out a sample, that the dishes were delightful to the palette. The mood in the room was very informal, with attendees asking questions whenever they arose, and throwing observations and ideas back and forth about different dishes they had tried themselves. When asked if she enjoyed new cookbooks, instructor Rachel mentioned during the class that her favorite place to find new recipes and substitution suggestions is online, by browsing other cooks' food blogs. This way real people will tell you what worked and what didn't, and in an open forum manner, vegans from all over the world can discuss and shape the best new tastes. Any new vegetarian or vegan can find it difficult to stay fresh and creative when busy with school, work, and other obligations, but the best resource is always other people. CAA has an open door for anyone looking for new recipes and suggestions on where to shop.